On April 21, 2011 Kiddieland Scooters have been jointly recalled with Kiddieland, Health Canada, and the United States Consumer Product Safety Commission (US CPSC). This recall involves three models of Kiddieland Lights and Sounds three-wheeled scooters: red Spiderman, blue Thomas the Train and a pink girl's scooter. The scooters have buttons on the handle that play music and sounds. The name "Kiddieland" is moulded on the back of the steering mechanism. Graphics of Spiderman or Thomas the Train are found on the steering mechanism and on the platform. The girl's model has a graphic of butterflies on the platform. In the United States, the US CPSC and Kiddieland have received two reports of children whose fingers got caught in the hinge mechanism and required stitches. At time of the recall neither Health Canada nor Kiddieland have received any reports of incidents or injuries related to the use of these scooters in Canada. You should immediately take the scooters away from children and contact Kiddieland for a free repair kit. For more information, you may contact Kiddieland toll-free at 1-800-430-5307 or visit the Kiddieland website. An estimated 700 of the recalled Spiderman scooters were sold direct from the Sears Canada website. Approximately 10 of the recalled scooters were sold direct from the JCPenny website to Canada. In the United States, approximately 16,000 of the recalled scooters were sold at Target and JCPenney stores nationwide and through target.com. 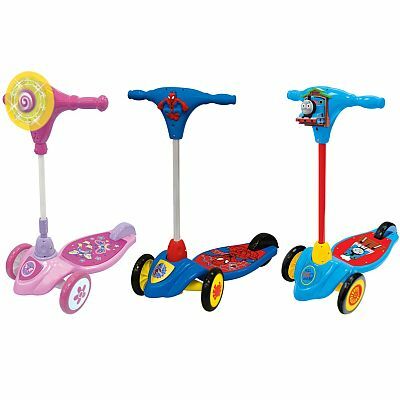 The recalled Spiderman scooters purchased direct from the Sears Canada website were sold from August 2010 to April 2011. The recalled scooters purchased direct from the JCPenny website were sold from January 2010 through February 2011. The scooters were manufactured in China and distributed by Kiddieland Toys Ltd. of Hong Kong.